A recent poll on Hacker News asking about Linux distributions of choice got me thinking, what can can we learn from a bigger picture of the distro landscape than a single HN poll? I went looking around and dug up a couple of other sources of information — Linux Journal’s annual reader’s choice awards, and data from Google Trends. What makes these three particular choices interesting is that they span a broad swathe of user types, from the hacker (Hacker News) to the enthusiast (Linux Journal) to the “average” Linux user (Google). That means we can learn from the trends across these three user types — considering which communities may be more predictive or more technical vs which represent broader adoption today. The results are shown below, ranked by Hacker News popularity so we can see distros popular with highly technical audiences most easily. Distros are shown in order of their Hacker News ranks. Hacker News data comes from here, Linux Journal data from here, and Google Trends data is from a US-based search. Ubuntu: The clear winner among all communities, with nearly half of users in the hacker (HN) and general (Google) communities as well as around 1/3 of enthusiasts (LJ). The relative lack of Ubuntu users among enthusiasts suggests that they may prefer a deeper level of flexibility so they can play around with the distro itself rather than just use it (Google) or build on top of it (HN). Arch: A strong showing, led by hackers, with equal proportions in the enthusiast and user communities. This suggests significant general appeal as well as a fulfillment of developer needs, or potentially predictive adoption by the HN community that will later be reflected more widely. Debian: Enthusiast-led adoption, with general users trailing. Mint: Extremely strong traction among general users, with hackers and enthusiasts far behind although still not negligible. Fedora: Broad appeal across many types of users, but trailing well behind the leaders. It’s worth noting that Fedora has perhaps the most even appeal of all distributions — does this mean that being good at everything means being great at nothing? Gentoo: No surprise, a source-based distro is most appealing to developers who need the flexibility and enthusiasts who like it. CentOS: Very clearly biased toward general users, its RHEL-based nature means it will be quite well-tested while lagging behind in updates. This is a fairly good fit for users who just want their OS to work, but it seems to create problems for enthusiasts and developers, who want or need the latest software. openSUSE: A similar trend as Slackware with even weaker developer adoption. It’s much less popular than any of the Debian-based distros or even Fedora, its closest resemblance on the list. To more closely examine which distros the Hacker News community biases towards, above and beyond their larger popularity, I created a graph based on the ratios between HN and Linux Journal or Google Trends usage, respectively. Higher numbers mean a stronger HN bias, while lower ones means a negative HN bias (HN users are less likely to use it). Compared to enthusiasts (LJ), hackers (HN) lean toward flexibility with Arch and community with Ubuntu, without sacrificing the ease of use required by Gentoo — which is often compared to Arch plus compilation. 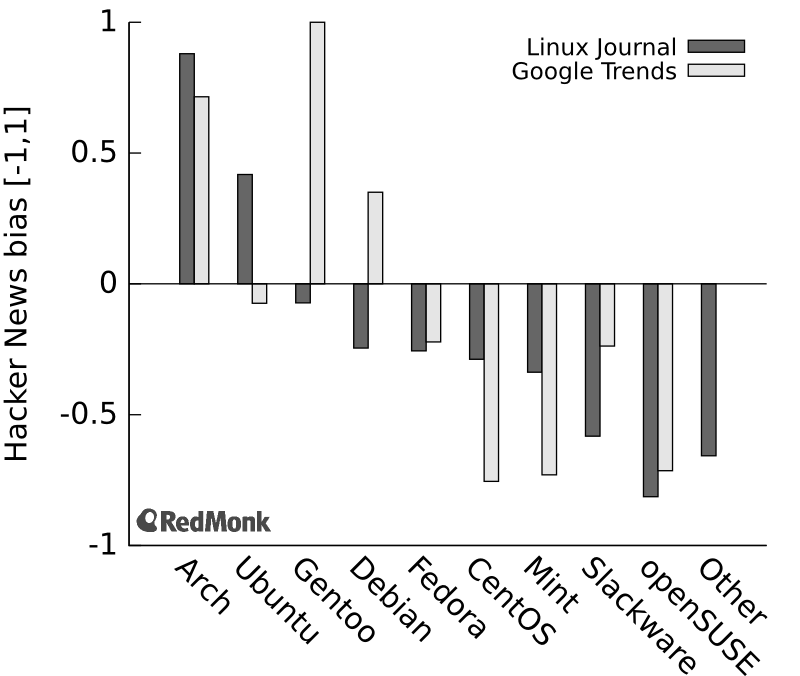 Compared to general users (Google), hackers show a very strong leaning toward flexibility with Arch and Gentoo, as well as a weaker bias toward Debian. Interestingly, hackers show a significant bias against CentOS and Linux Mint — we discussed some reasons for CentOS above but the reason for a lack of Linux Mint users is unclear to me. I’ve shown the distros that are holding stable or growing in red, while the rest are in gray, and a pattern quickly becomes clear: The older Linux distributions appear to be bleeding users. They’re all shrinking after a peak around 2004–2005 (Fedora, Debian, Slackware, Gentoo) or later peaks around 2007–2009 (Ubuntu, openSUSE). The sole exception is CentOS, which is merely holding steady rather than shrinking, perhaps because it has an entirely different set of users than your typical distro. Where are the users going? Some of them are definitely going to be moving to the growing distros, but many of them are also shifting to another OS entirely — OS X. Next time you’re at a conference, take a look around and count how many Macs and how many PCs you see. Apple’s appeal to developers is undeniable, and some of the more pragmatic Linux users decided that a different Unix-based OS was the better choice for them. You may have heard, like déjà vu, that this year is the year of the Linux desktop? Looks like it happened back in 2005, and we missed it. Based on these datasets, the Linux userbase today is defined by Debian-based distros. Ubuntu in particular has made itself interesting to general users and developers alike, a difficult feat. Its popularity in the cloud may well have something to do with its developer appeal. Linux Mint may have hit upon a winning formula for a general userbase, worth looking into for creators of the other distros, while Arch seems to have nailed the hacker community. Disclosure: Red Hat is a client, and Canonical has been. SUSE and Apple are not. Categories: adoption, community, linux, open-source, operating-systems.